William Wallace was a classical scholar, a doctor and eye surgeon, a poet and dramatist, a writer on music and musicians, and the man described by Shaw as 'a young Scotch composer with a very tender and sympathetic talent'. His orchestral compositions rank amongst them the earliest attempts at the genre of the symphonic poem to be made in the British Isles, his choice of subjects for these being at least as wide-ranging as his own interests and achievements. 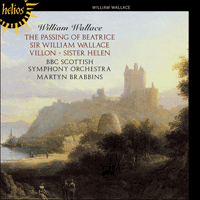 This album presents the first commercial recordings of any of Wallace’s compositions—an astonishing fact made all the more significant when it is realized that these fine symphonic poems are among the first attempts at the genre made in the British Isles. Their subjects are no less adventurous than their composer: William Wallace (Scottish hero, freedom-fighter; beheaded and dismembered by the English); François Villon (rebel poet, tortured; escaped the gallows by inches; early death a mystery); Beatrice (heroine of purity, pulsing in the rose of Dante’s heaven); and Sister Helen (villainess, murdering by sorcery; insane with jealous and frustrated love). This is a remarkable late medieval case-book from the pen of Dr William Wallace. All four characters are straining at the bounds of human possibility; and yet these studies of human nature at its extremities are deeply felt and profoundly sympathetic. As a doctor and clinician it was Wallace’s business to observe and record with detachment; as an artist the same was to be done with feeling. It is the balanced truthfulness of Wallace’s own humanity that allows us to feel with and for his subjects without a hint of pedantry on the one hand, or any gross sentimentality on the other. These are musical portraits of power and integrity. But William Wallace, MD, MCh, Captain RAMC, was remarkable in his own right. He was a classical scholar, a doctor and eye surgeon, a poet and dramatist, a painter, a writer on music and musicians, and a composer. He was efficient—he became inspector of ophthalmic units in Eastern Command in the Great War; observant—he used his skills as a painter to make careful depictions of eye disorders; scholarly—he published a paper on sixteenth- and seventeenth-century Greek ligatures; polemical—his books on music are splendidly provocative; and selfless—in the last two-and-a-half years of his war service he was not off duty for a single day. William Wallace was born in 1860 and, like Hamish MacCunn (see Hyperion CDA66815), was a son of Greenock. His father, James Wallace, was a distinguished surgeon who may have had to examine his own son when the latter graduated MB and MCh in 1885 at Glasgow University. William went on to study ophthalmology at Glasgow in 1888, about which time he published words and music of a Carmen Glasguense in honour of the university, the bold cover design of a student with mortar-board, books and symbolic Hebrew letter Shin being his own. But for Wallace the ear was to prove stronger than the eye and he finally settled on music, studying at the Royal Academy of Music, though only for two terms, and thereafter teaching himself. He was one of the six rebels, including his younger contemporary Bantock (also the son of a Scottish-based surgeon), who challenged the conservatism of the music schools of the time. With Bantock Wallace published The New Quarterly Musical Review, frequently editing it with Anderton when Bantock was away. In a letter of 1904 Wallace asks that the Royal College of Music jury give ‘a chance to even the most bizarre and so-called eccentric compositions that are sent in’; with respect to controversies at the Leeds Festival he intends to ‘march in the direction of the guns’! In 1964 Neville Cardus described Wallace as ‘a composer who was one of the first in the progressive movement of seventy years ago’, and some years later, praising The Passing of Beatrice and Villon, recalled Wallace’s Freebooter Songs, ‘one of which, called “Son of Mine”, I sang myself on smoky Saturday nights for a guinea a time’. It is a pleasing thought that such a progressive composer as Wallace was capable of writing words and music (not to mention designing the cover) for songs which were to achieve such popularity. The Wallace household must have been a fascinating one, for he married the distinguished Scottish sculptress Ottilie Helen McLaren, daughter of Lord McLaren. Wallace dedicated his A Suite in the Olden Style for piano to her. She was a pupil of Rodin and exhibited regularly at the Royal Academy, though in 1928 she was unable to enter so William promptly produced a painting, ‘Waterloo Drum’, of a corner of their own house in London and submitted it to ensure the family was represented. It was accepted and duly hung on the line. The 1914–1918 war saw Wallace working more or less continuously in the Royal Army Medical Corp, from which he retired in 1919 with the rank of captain. By the end of the war he was fifty-eight years of age, had taken only three weeks of leave and had reported on 19,000 cases over four years, many of which he had personally attended. He must have been completely drained. In his later years he became professor of harmony and composition at the Royal Academy of Music (and professorial chief of the library) when his fellow Scot and composer John Blackwood McEwen was Principal. Wallace’s major works include the fine Creation Symphony (first performed at one of Bantock’s New Brighton concerts in 1899 and recorded on Hyperion CDA66987), the lovely Pelléas et Mélisande Suite of 1903, and a bitingly satirical choral ballad, The Massacre of the Macphersons, which makes a ridiculous combination of snippets from Wagner’s Ring and traditional Scottish themes. There are two further symphonic poems and a number of other pieces, all worthy of attention. Wallace is much more radical than Mackenzie or MacCunn, particularly in his freer development of structure. He also published several books on music theory and history. These include wide-ranging and challenging works analyzing the nature and development of the musical faculty in humankind; and studies of great insight into Wagner and Liszt, whose influence on his own music is clear. He died in 1940. 23 August 1905 was the 600th anniversary of the death of the great Scottish patriot and freedom fighter William Wallace. His story has been the inspiration of innumerable poems, novels, songs and orchestral works, and in the film Braveheart has joined the long list of epic romances of the silver screen. Robert Burns was no less affected by the legend than others. His verses set to the old Scotch marching tune of Hey Tutti Tatti open famously with the words, ‘Scots wha’ hae wi’ Wallace bled …’. That tune has led Scottish troops, both regular and mercenary, to battle in every corner of the globe; it led Joan of Arc to the gates of Orléans and beyond; it has established itself as one of the world’s most powerful musical and poetic icons; but its association with William Wallace is entirely due to Burns who recognized its appropriateness to a theme dear to his heart. For Wallace’s namesake, the composer William Wallace, the anniversary was an opportunity of national importance, not to be missed. He rose to the occasion with Sir William Wallace, a work of powerful celebration, first performed under Sir Henry Wood on 19 September at the Queen’s Hall Promenade Concerts. It is probably deliberate on the composer’s part that there remains something unsaid at the end of the piece. In 1905 there was little sign of a Scottish National movement, and any reference to Wallace’s final end would have been less that celebratory anyway—Wallace was the architect of his nation’s freedom but, like Moses, he did not live to enter into his promised land. By his own people he was betrayed into the hands of the English who executed and dismembered him, displaying his mutilated parts and making up in thoroughness what they lacked in chivalry. But the significance of the date and the coincidence of the name could not be denied. The music is splendidly direct, as befits the celebration of a great military hero. The main theme is derived from ‘Scots wha’ hae’; but the tune only emerges overtly at the end, Wallace himself pointing out that this was a reversal of the usual form. There is no programme to the work, which falls into four sections, but the brooding opening has pre-echoes of the main theme, and it seems as though the awareness of a national identity is slowly emerging, mirrored musically by the use of pentatonic motifs. Wallace, a caustic yet sympathetic observer of humanity, has created here a brilliant psychological, but deeply affecting portrait, based on carefully chosen and beautifully ordered quotations from Villon’s Grand Testament which are printed in the score. Himself a remarkable scholar, he has perfectly judged the self-pitying pleading of the opening: ‘Ung pouvre petit escollier qui fut nommé Françoys Villon’. We know we are being manipulated by the twists of these musical gestures, including their occasionally ironic largesse; and with jaunty interpolations, Wallace hints at the mischief to come: ‘Au moins sera de moy memoire tel qu’il est d’ung bon folastre’. The bassoon leads us off to the pub and the brothel (‘Où s’en va tout? Or escoute: Tout aux tavernes et aux filles’) but the consequences of this momentarily riotous behaviour are only disappointment and poverty again. The opening penurious phrase returns, this time more reflectively as Wallace draws us towards Villon’s immortal lines on mortality from the Ballade des Dames du Temps jadis: ‘Mais où sont les neiges d’antan?’ At first the Ballade asks what has become of the great courtesans of the past, Flora and Thaïs, and the Queen of Burgundy who threw her discarded lovers, often students, into the Seine. Wallace evokes the nostalgic grandeur with richly orchestrated lyricism, and briefly we relive those days of beauty and passion, gaining from stately crotchet motion to expansive sensual folds of quavers. But the Ballade ends with France’s virgin martyr, Joan of Arc, as vulnerable to time as the rest of them: ‘Où sont-ils, où, Vierge souvraine?’ demands Villon. N’a cheval; las! et comment donc? Et ne m’a laisse quelque don. Le salut que l’Ange predit. The prayer to the virgin is reduced to a brief line of penitence: ‘Où sont-ils, où, Vierge souvraine?’ There is no answer: only a hushed whisper from the bass clarinet and a wisp of a padded stick on a tamtam, scarcely audible, so that we do not even know when precisely is the moment of death. Dante is lost in wonderment at the vision, and in turning to question Beatrice, finds that she is no longer by his side, but has passed away from him to take her place within the rose of Paradise. The music is designed to illustrate the passing, or transition, of Beatrice from earthly to immortal form. Wallace’s score is intensely romantic in idiom, combining both the purity and sensual imagery of Dante’s vision, in which the angels are likened to bees bearing the honey (symbolic of Christ) from a white rose made up of the souls of the blessed. It is to the third circle of petals in this rose that Beatrice is translated. With its lush harmonies and rich orchestration balanced by thoughtfulness and restraint, Wallace’s music is something more than sweet. The strings, with violins divided and half of them muted, set a tone of hushed reverence, and their opening ascending motif provides the rhythmic basis for most of the work. This motif goes through a process of transformation: a hymn, an intense chromatic passage for woodwind of deep personal feeling, which rises to a passionate and ecstatic expression of love, and finally a calm and ethereal peace. Came through that medium down, unmix’d and pure. Three days to-day, between Hell and Heaven! The opening Largo sostenuto depicts her brooding jealousy and, in the woodwind, the flame of the waxen image of her betrayer. Recollection of her former love, expressed with great feeling, only wells up to the dotted rhythm of the first fortissimo, cruelly anticipating her ultimate triumph. Fire at the heart, between Hell and Heaven! The Andante describes the tokens and pleas of her former lover, forming a kind of slow movement, musically isolated, as it should be, from the perverse emotions of Sister Helen which break out again at the Con fuoco. Others ride to her to beg her to break the spell, but to no avail. The extreme melodrama of the subject might have tempted a lesser composer into a work of unremitting gloom, but Sister Helen’s own memories of true love return in varied form, and it is typical of Wallace’s rounded view of his characters that he allows her a true memory of beauty—something not granted her in the poem. Lost, lost, all lost, between Hell and Heaven! Le présent album offre les premiers enregistrements commerciaux de compositions de Wallace—fait d’autant plus surprenant que ces beaux poèmes symphoniques comptent les premières tentatives du genre jamais effectuées dans les îles Britanniques. Les sujets ne sont pas moins aventureux que leur compositeur: William Wallace (héros écossais, combattant de la liberté; décapité et démembré par les Anglais); François Villon (poète rebelle, torturé; échappa de peu à la potence; mort prématurée et mystérieuse); Béatrice (héroïne de pureté, palpitant dans la rose du ciel de Dante); Sœur Helen (vilaine, assassinant par sorcellerie; folle d’amour jaloux et frustré). Tel est le remarquable recueil de cas de la fin du Moyen Âge, issu de la plume du Docteur William Wallace. Malgré des personnages forcés aux limites du possible, ces études de la nature humaine en ce qu’elle a de plus extrême sont profondément senties et compatissantes. Le travail de Wallace médecin et clinicien consistait à observer et à analyser avec détachement; il allait conserver la même démarche en tant qu’artiste, la sensibilité en plus. La véracité objective de la propre humanité de Wallace nous permet de ressentir ses sujets sans la moindre pédanterie ni la moindre sentimentalité fruste, tant ces portraits musicaux sont tout de puissance et d’intégrité. Mais William Wallace, docteur en médecine et en chirurgie, capitaine dans le service de santé des armées britanniques, était lui-même un être remarquable: humaniste, docteur et chirurgien des yeux, poète, dramaturge, peintre, auteur d’écrits sur la musique et sur les musiciens, et compositeur, il était efficace—il devint inspecteur des unités ophtalmologiques dans l’Eastern Command durant la Grande Guerre; observateur—il utilisa ses talents de peintre pour effectuer des représentations minutieuses des troubles oculaires; érudit—il publia un article sur les ligatures grecques des XVIe–XVIIe siècles; polémique—ses livres sur la musique sont superbement provocateurs; et altruiste—il demeura de garde sans un jour de repos pendant les deux dernières années et demie de son service de guerre. William Wallace naquit en 1860 à Greenock, patrie de Hamish MacCunn (voir Hyperion CDA66815). Son père, James Wallace, était un chirurgien éminent, qui put être l’examinateur de son propre fils en 1885, lorsque celui-ci obtint sa licence de médecine et de chirurgie à l’université de Glasgow. Trois ans plus tard, William alla étudier l’ophtalmologie à Glasgow et publia les paroles et la musique d’un Carmen Glasguense en l’honneur de l’université. Mais pour Wallace, l’oreille allait se révéler plus forte que l’œil: il choisit finalement la musique et étudia à la Royal Academy of Music, mais seulement pendant deux trimestres, avant d’enseigner lui-même. Il fut, aux côtés de son cadet Bantock (également fils d’un chirurgien établi en Écosse), l’un des six rebelles qui défièrent le conservatisme des écoles musicales de l’époque. Avec Bantock, Wallace publia The New Quarterly Musical Review, qu’il édita souvent avec Anderton en l’absence de Bantock. Dans une lettre de 1904, Wallace demande au jury du Royal College of Music de «donner une chance aux compositions les plus bizarres et soi-disant excentriques qui [lui] sont envoyées»; quant aux controverses du Leeds Festival, il entend «marcher dans la direction des fusils»! En 1964, Neville Cardus décrivit Wallace comme «un compositeur qui fut l’un des premiers du mouvement progressiste d’il y a soixante-dix ans» et quelques années plus tard, louant The Passing of Beatrice et Villon, il se rappela les Freebooter Songs de Wallace: «je chantais moi-même l’une d’entre elles, ‘Son of Mine’, pour une guinée la chanson, dans les samedis soirs enfumés». Il est plaisant de penser qu’un compositeur progressiste comme Wallace pût écrire les textes et les musiques (sans parler de la conception de couvertures) de chansons promises à une telle popularité. Le couple Wallace dut être fascinant car William épousa l’éminente sculptrice écossaise Ottilie Helen McLaren, fille de Lord McLaren, à laquelle il dédia sa Suite in the Olden Style, pour piano. Élève de Rodin, elle exposa régulièrement à la Royal Academy, sauf en 1928, année où elle ne put s’inscrire. William produisit alors «Waterloo Drum», une peinture d’un coin de leur propre maison londonienne, qu’il soumit pour s’assurer que la famille fût représentée. L’œuvre fut acceptée et lui valut les honneurs de la cimaise. La guerre de 1914–1918 le trouva plus ou moins continuellement dans le service de santé des armées britanniques, dont il sortit capitaine en 1919. À la fin de la guerre, âgé de cinquante-huit ans, il n’avait pris que trois semaines de permission et avait rédigé un rapport sur dix-neuf mille cas en quatre ans, cas qu’il avait, pour beaucoup, traités en personne. Ce qui dut complètement l’éreinter. Dans les années qui suivirent, il devint professeur d’harmonie et de composition à la Royal Academy of Music (et chef professoral de la bibliothèque), du temps où son compatriote écossais, le compositeur John Blackwood McEwen, en était le directeur. Parmi les œuvres majeures de Wallace, citons la belle Creation Symphony (interprétée pour la première fois lors d’un des concerts de New Brighton de Bantock, en 1899, voir Hyperion CDA66987), la charmante suite Pelléas et Mélisande de 1903 et une ballade chorale au mordant satirique, The Massacre of the Macphersons, qui combine ridiculement des bribes du Ring de Wagner et des thèmes traditionnels écossais. Sans oublier deux autres poèmes symphoniques et un certain nombre de pièces, toutes dignes d’attention. Wallace s’avère beaucoup plus radical que Mackenzie ou MacCunn, particulièrement dans son développement libre de la structure. Il publia également plusieurs livres sur la théorie et l’histoire musicales, dont des ouvrages de grande portée, analyses stimulantes de la nature et du développement de la faculté musicale dans l’humanité, mais aussi études d’une grande perspicacité sur Wagner et Liszt, compositeurs qui l’influencèrent nettement. Il mourut en 1940. Le 23 août 1905 correspondit au six centième anniversaire de la mort du grand patriote écossais et combattant pour la liberté William Wallace. Son histoire, qui a inspiré d’innombrables poèmes, romans, chansons et œuvres orchestrales, a également rejoint la longue liste des romans épiques du grand écran, avec le film Braveheart. Pour le compositeur homonyme du héros, cet anniversaire était une opportunité d’importance nationale à ne pas manquer. Il se montra à la hauteur de l’événement avec Sir William Wallace, une œuvre puissamment commémorative, dont la première eut lieu le 19 septembre, lors des Promenade Concerts du Queen’s Hall, sous la direction de Sir Henry Wood. Villon fut le dernier des six poèmes symphoniques composés. Interprété pour la première fois par le New Symphony Orchestra en mars 1909, il fut publié par Schott en 1910. François Villon (1431–1463), meurtrier, fornicateur, grand poète et, avec Rabelais, héros de la fin de la conscience médiévale, fut un homme à l’irrévérence si pleine d’humanité qu’elle ne requit jamais de pardon, et aux plaisirs malicieux si mêlés d’afflictions éternelles qu’il est impossible de ne pas lui vouer la plus profonde affection. Observateur caustique mais sympathique de l’humanité, Wallace a brossé ici un portrait psychologique brillant et profondément émouvant, fondé sur des citations du Grand Testament de Villon, soigneusement choisies et merveilleusement agencées, toutes imprimées dans la partition. Érudit remarquable, il a parfaitement jugé le plaidoyer apitoyé de l’ouverture: «Ung pouvre petit escollier qui fut nommé Françoys Villon». Dante est perdu dans l’émerveillement de la vision lorsque, se tournant pour interroger Béatrice, il découvre qu’elle n’est plus à ses côtés, qu’elle s’est éteinte pour prendre place dans la rose du paradis. La musique entend illustrer le trépas, le passage de Béatrice d’une forme terrestre à une forme immortelle. Sœur Helen personnifie une approche de l’amour aux antipodes de celle de Béatrice—une revanche implacable, motivée par la trahison et la jalousie. Ce poème symphonique, le troisième et peut-être le plus intense de Wallace, repose sur un poème de Dante Gabriel Rossetti. Le Largo sostenuto initial dépeint la jalousie menaçante de l’héroïne tandis que les bois évoquent la flamme de la figure cireuse de celui qui la trahit. Le souvenir de son amour passé, exprimé avec une grande sensibilité, ne monte que jusqu’au rythme pointé du premier fortissimo, anticipant cruellement son triomphe ultime. Le Vivace, de style écossais, décrit avec une innocence mélodieuse le petit frère qu’elle envoya à la fenêtre voir si un cavalier approchait. L’Andante dépeint les souvenirs et les appels de son amour passé, formant une sorte de mouvement lent, musicalement isolé, comme il se doit, des émotions perverses de sœur Helen, qui ressurgissent au Con fuoco. Mais la fin est véritablement inévitable et la stance finale est amenée à son effroyable concrétisation avec une puissance intense, qui voit le fantôme de son amour défunt condamné à errer, comme le sien le sera, jusqu’au jugement dernier. Auf dieser Album präsentieren wir Ihnen die ersten kommerziellen Einspielungen von William Wallaces Kompositionen—eine erstaunliche Tatsache, die noch bedeutender wird, wenn man bedenkt, daß diese meisterhaften symphonischen Gedichte die ersten Versuche in diesem Genre in Großbritannien sind. Die Helden dieser Werke sind nicht weniger abenteuerlich als ihr Schöpfer: William Wallace (Schottischer Held, Freiheitskämpfer; von den Engländern enthauptet und zergliedert); François Villon (Rebellischer Poet, leidgeprüft; entrann seinem Schicksal am Galgen um Haaresbreite; sein früher Tod ist ein Rätsel); Beatrice (Reine Heldin, pulsierend in der Rose von Dantes Himmel); Schwester Helen (Die Böse. Mordet mit Zauberkunst; verrückt vor Eifersucht und enttäuschter Liebe). Es handelt sich bei diesem Werk um eine bemerkenswerte spätmittelalterliche Geschichtensammlung aus der Feder des Dr. William Wallace. Alle vier Figuren bewegen sich am Rande des Menschenmöglichen; und doch sind diese Studien der menschlichen Natur in ihrem Extrem tieffühlend und äußerst verständnisvoll. Als Arzt und Kliniker war es seine Aufgabe, mit Distanz zu beobachten und zu notieren; als Künstler war das gleiche von ihm gefordert, doch mit Gefühl. Die ausgewogene Ehrlichkeit von Wallaces eigener Menschlichkeit ermöglicht es uns, ohne eine Andeutung von Pedanterie einerseits oder übermäßige Gefühlsduselei andererseits mit und für seine Helden zu fühlen. Dies sind musikalische Portraits von Kraft und Integrität. Doch William Wallace, Doktor der Medizin, Magister der Chirurgie, Hauptmann im Ärztekorps des britischen Heeres, war selbst schon ein bemerkenswerter Mann. Er war ein klassischer Gelehrter, Arzt und Spezialist für Augenkrankeiten, Dichter und Dramatiker, Maler, Verfasser von Schrifttum über Musik und Musiker sowie Komponist. Er war tüchtig—im ersten Weltkrieg wurde er als Inspektor der Augenheilkundeeinheiten im östlichen Befehlsbereich eingesetzt; ein guter Beobachter—mit seinen Malkünsten bildete er Augenkrankheiten sorgfältig ab; gelehrsam—er veröffentlichte eine Abhandlung über griechische Ligaturen im 16./17. Jahrhundert; polemisch—seine Bücher über Musik sind herrlich provozierend; und selbstlos—in den letzten zweieinhalb Jahren seines Kriegseinsatzes war er nicht einen einzigen Tag außer Dienst. William Wallace wurde 1860 geboren und war, genau wie Hamish MacCunn (siehe Hyperion CDA66815) ein Sohn Greenocks. Sein Vater, James Wallace, war ein hochrangiger Chirurg, der vielleicht Prüfer seines Sohnes war, als dieser 1885 sein Studium an der Universität Glasgow mit einem Magister der Medizin und Chirurgie abschloß. William setzte 1888 sein Studium im Fach Augenheilkunde an der gleichen Universität fort. Um diese Zeit etwa veröffentlichte er den Text und die Musik einer Carmen Glasguense zu Ehren der Universität, wobei die kühne Einbandgestaltung mit einem Studenten mit Doktorhut, Büchern und dem symbolischen hebräischen Buchstaben Schin von ihm selbst stammt. Doch für Wallace sollte sich das Ohr stärker als das Auge erweisen, und er entschied sich schließlich für die Musik. Er studierte an der Royal Academy of Music—jedoch nur zwei Trimester. Danach fuhr er im Selbststudium fort. Er war einer der sechs Rebellen, zu denen auch sein jüngerer Zeitgenosse Bantock (ebenfalls Sohn eines in Schottland tätigen Chirurgen) zählte, und stellte den Konservatismus der Musikschulen seiner Zeit in Frage. Mit Bantock veröffentlichte Wallace The New Quarterly Musical Review („Die neue vierteljährliche Musikrezension“), eine Veröffentlichung, die er in Bantocks Abwesenheit häufig mit Anderton redigierte. In einem Brief bittet Wallace 1904 die Jury des Royal College of Music, „auch den bizarrsten und sogenannten exzentrischen Kompositionen, die eingesandt werden, eine Chance zu geben“; hinsichtlich der Kontroversen beim Festival von Leeds will er „in Richtung der Gewehre marschieren“! Im Jahr 1964 beschrieb Neville Cardus Wallace als „einen Komponisten, der einer der ersten in der Fortschrittsbewegung vor siebzig Jahren war“, und einige Jahre später, als er die Werke The Passing of Beatrice („Das Hinscheiden der Beatrice“) und Villon lobte, erinnerte er sich an Wallaces Freebooter Songs („Freibeuterlieder“), „von denen ich eines, ‘Son of Mine’ („Mein Sohn“), selbst an rauchigen Samstag Abenden für jeweils eine Guinee sang“. Es ist ein erfreulicher Gedanke, daß ein so fortschrittlicher Komponist wie Wallace in der Lage war, Worte und Musik (und nicht zu vergessen die Einbandgestaltung) für Lieder zu schaffen, die so populär werden sollten. Der Haushalt der Familie Wallace muß faszinierend gewesen sein, denn er heiratete die angesehene schottische Bildhauerin Ottilie Helen McLaren, die Tochter von Lord McLaren. Ihr widmete Wallace A Suite in the Olden Style („Eine Suite im alten Stil“) für Klavier. Sie war eine Schülerin Rodins und stellte regelmäßig an der Royal Academy aus. 1928 war sie dazu jedoch nicht in der Lage, und so fertigte William prompt ein mit „Waterloo Drum“ betiteltes Gemälde an, das eine Ecke ihres eigenen Hauses in London darstellte, und reichte es ein, denn er wollte sicherstellen, daß die Familie vertreten war. Das Gemälde wurde angenommen und auch ganz ordnungsgemäß aufgehängt. Im Krieg von 1914–18 arbeitete Wallace mehr oder weniger ununterbrochen für das Ärztekorps des britischen Heers. Er schied 1919 mit dem Dienstgrad eines Hauptmanns aus dem Militärdienst aus. Bei Kriegsende war er 58 Jahre alt, hatte nur drei Wochen Urlaub genommen und in vier Jahren Berichte über 19000 Fälle verfaßt, von denen er zahlreiche selbst behandelt hatte. Er muß völlig ausgelaugt gewesen sein. In seinen späteren Jahren wurde er Professor für Harmonie und Komposition an der Royal Academy of Music (und zuständiger Professor für die Bibliothek), als sein schottischer Landsmann und Komponistenkollege John Blackwood McEwen dort der Rektor war. Zu Wallaces wichtigsten Werken zählen die großartige, an einem von Bantocks Konzerten in New Brighton im Jahr 1899 uraufgeführte Creation Symphony („Schöpfungssymphonie“, siehe Hyperion CDA66987), die liebliche Pelléas et Mélisande-Suite aus dem Jahr 1903 sowie eine beißend satirische Chorballade The Massacre of the Macphersons („Das Massaker der MacPhersons“), die eine absurde Kombination aus Bruchstücken von Wagners Ring und traditionellen schottischen Themen darstellt. Außerdem gibt es zwei weitere symphonische Gedichte und eine Reihe anderer Werke, die alle Aufmerksamkeit verdienen. Wallace ist bei weitem radikaler als Mackenzie oder MacCunn, insbesondere bei seiner freieren Entwicklung der Struktur. Er veröffentlichte auch mehrere Bücher über Musiktheorie und -geschichte. Diese umfassen weitreichende und herausfordernde Werke, die die Natur und Entwicklung der musikalischen Fähigkeiten der Menschheit analysieren, sowie Studien, die ein gutes Verständnis von Wagner und Liszt vermitteln, deren Einfluß auf seine eigene Musik deutlich ist. Er starb 1940. Der 23. August 1905 war der 600. Todestag des großen schottischen Patrioten und Freiheitskämpfer William Wallace. Seine Lebensgeschichte diente als Inspiration für unzählige Gedichte, Romane, Lieder und Orchesterwerke. Mit dem Film Braveheart hat sie nun auch einen Platz auf der langen Liste der romantischen Leinwandepen. Für Wallaces Namensvetter, den Komponisten William Wallace, war dieses Jubiläum eine Gelegenheit von nationaler Bedeutung, die es nicht zu versäumen galt. Wallace zeigte sich der Lage gewachsen und schuf Sir William Wallace, ein Werk von nachdrücklicher Verherrlichung, das am 19. September unter der Leitung von Sir Henry Wood bei den Queen’s-Hall-Promenadenkonzerten uraufgeführt wurde. Villon wurde als letztes in der Reihe der sechs symphonischen Gedichte komponiert. Es wurde vom New Symphony Orchestra im März 1909 uraufgeführt und 1910 von Schott verlegt. François Villon (1431–1463), ein Mörder, Hurenbock, großer Dichter und, mit Rabelais, Held des letzten mittelalterlichen Bewußtseins, dessen Respektlosigkeit so sehr von Menschlichkeit erfüllt ist, daß sie nie der Vergebung bedurfte, und dessen schalkische Freuden so mit den ewigen Sorgen vermischt sind, daß es unmöglich ist, nicht die tiefste Zuneigung für ihn zu verspüren. Wallace, ein bissiger, doch mitfühlender Beobachter der Menschheit, hat in diesem Werk ein außerordentliches psychologisches, doch zutiefst rührendes Portrait geschaffen, das auf sorgfältig ausgewählten und wunderschön angeordneten Zitaten aus Villons Grand Testament basiert, die in der Partitur gedruckt sind. Als bemerkenswerter Gelehrter hat Wallace das selbstbemitleidende Flehen der Eröffnung perfekt beurteilt: „Ung pouvre petit escollier qui fut nommé Françoys Villon“. Dante verliert sich beim Anblick der Vision in Staunen, und als er sich fragend an Beatrice wendet, stellt er fest, daß sie nicht mehr an seiner Seite, sondern dahingeschieden ist, um ihren Platz in der Rose des Paradieses einzunehmen. Die Musik soll das Hinscheiden oder den Übergang Beatrices von der irdischen zur unsterblichen Daseinsform veranschaulichen. Schwester Helens Art in der Liebe ist das genaue Gegenteil von Beatrices Wegen—unerbittliche Rache, motiviert von Verrat und Eifersucht. Dieses Werk, das dritte und vielleicht ernsthafteste von Wallaces symphonischen Gedichten, basiert auf einem Gedicht von Dante Gabriel Rossetti. Das Largo sostenuto in der Eröffnung stellt ihre brütende Eifersucht dar, und die Holzblasinstrumente die Flamme des wächsernen Bildes des Mannes, der sie verraten hat. Die Erinnerung an ihre alte Liebe, ausgedrückt mit viel Gefühl, kommt nur zum punktierten Rhythmus des ersten Fortissimo an die Oberfläche und antizipiert dabei grausam ihren letztendlichen Triumph. Das Vivace, schottische Folklore, beschreibt mit munterer Unschuld den kleinen Bruder, den sie an das Fenster geschickt hat, um nach einem nahenden Reiter Ausschau zu halten. Das Andante beschreibt die Gesten und das Flehen ihres vormaligen Geliebten und bildet eine Art langsamen Satz, der, ganz wie es sein sollte, von den perversen Emotionen der Sister Helen, die beim Con fuoco wieder ausbrechen, musikalisch isoliert ist. Doch das Ende ist in der Tat unabwendbar, und die letzte Strophe erreicht wirksam das furchtbare Ziel, als der Geist ihres toten Geliebten dazu verdammt wird, wie ihr Geist bis zum letzten Gericht zu wandern.